Click here to download the FREE “Offer Checklist”, Feel free to contact me directly if you have any questions. I can be reached at 602 369-8119 or via email at [email protected]. Wouldn’t you like to launch successful digital marketing campaigns every time you initiated one? Well, I can hear it now, a resounding “Yes!” in the consciousness of marketers across the globe. Entre nous – It can happen if you know the initial and paramount steps to setting one up. In this video, I discuss the 5 steps we call P.I.X.E.L. here at Direct Business Marketing. Watch the video and reach out to us if you have any inquiries. This month, we are going to kick off our Nurture Marketing Series. We’re going to answer specific questions about how and why you should institute nurture marketing within your organization. In our marketing process – generate, capture, store, and nurture, we’re going to focus on just the “Nurture” portion of our process. 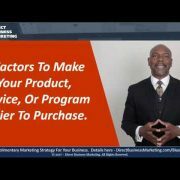 So, follow us on this 4-part series where Andrew Houglum – the CTO, Dustin Fickbohm – the COO, and me, Granison Shines – the CMO, talk about how Nurture Marketing can help grow your business. Nurture Marketing involves reaching out to your prospects and clients on a regular basis, touching them via marketing mediums, feeding them the information they need about your business, educating them on various topics regarding your products or services, making them feel good about your business, and building a stronger relationship with them. You can use any medium you’d like to share this information including, but not limited to: email, video, newsletters, postcards, etc. The objective of this campaign is to create continued awareness and foster a relationship utilizing non-sales based email and/or print mediums. The objective of this campaign is to convert Customer’s new leads into new clients. DBM understands that new leads are extremely important, and following up with the leads needs to happen immediately and automatically. The objective of this campaign is to assist Customer’s new clients in getting the most out of their recently purchased product/service. The objective of this nurture campaign is to cause the recipient to take action. This campaign can be used to: reactivate clients, promote an event, new product launch, and many more. The objective of this campaign is to upsell Customer’s existing clients into purchasing more products/services that you currently offer. At the very least, your organization should keep in touch with the leads in your existing database by keeping leads on an Annual Nurture campaign. The good thing about what we’re talking about is, these are the same ideals we use in our own business. We don’t believe in not practicing what we preach. Even when we’re extending our consulting advice to our clients, we’re still singing the same song. So, tune in on what we’re talking about in this video and let me know if you have any questions. I can be reached directly at 602 369-8119 or feel free to email me at [email protected]. Here’s how you can tell if a nurture marketing strategy would benefit you and your organization. Go to – https://directbusinessmarketing.com/vmc/. There you will find Direct Business Marketing’s Virtual Marketing Consultation. Inbound Marketing is described as – promoting a company through its blogs, video, eBooks, eNewsletters, Podcasts, case studies, whitepapers, SEO, physical products, social media, and other forms of content marketing which serve to attract interested customers through the different stages of the sales cycle. Ok – so in this video, the boys and I talk about using social media to further your inbound marketing plan. In all efforts of being straight to the point and not beating around the bush, I’m going to give you one of the best marketing ideas to get free social media traffic to your website so you can educate them and grow your list at the same time. Now I do want to add one caveat! Please, please, make sure that your content is entertaining to some degree. Meaning, if it remotely has an entertainment value to it, people will pay attention longer. Hey, we all want to be entertained, right? Anywho, here’s the scoop! First, create a video or an image post. I personally like video. Remember, if it’s remotely entertaining, it can really get some attention. Second, when writing the content, only tease the information on which you are speaking. On the social media medium, you only want to whet the appetite so you can send them to the landing page that has more content, or the full range of content. Third, add a “jump URL” to the actual landing page. This is what I was alluding to in the second point. Here you want them to view the full extent of the content, as well as, get nosy and start snooping around looking at other stuff you have to offer on your website. Believe it or not, if you content is good, they’re going to check out other posts you’ve put up about the subject matter. Forth, make sure you have a call-to-action (CTA) on “that” landing page somewhere. 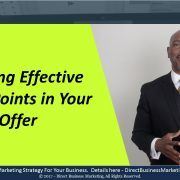 Take the opportunity to get them to opt-in for some soft or hard offer they can get right away. This way, it’s a win-win for both of your; they get something they want, you offer, and you get something you want, their name and email at the very least. “Fif” (I know it’s “fifth), and this should go without saying but I’m going to say it anyway, make sure you have a CRM to manage the contacts in the list you’re building. There – I said it!!! Well, here’s how you can tell if an inbound marketing strategy would benefit you and your organization. Go to – https://directbusinessmarketing.com/vmc/. There you will find Direct Business Marketing’s Virtual Marketing Consultation. In this video, the boys and I talk about which mediums we feel are the most effective. Obviously, testing in your market is going to be the best judge of character in the long run, but in the short and immediate to spark some movement to get you off the fence, grab something to sip on, and click the play button to watch the video. eBooks – small, or big, electronic books that are available for immediate download from clients. These are some good ones to name a few. The only issue is, they take quite some time to generate, as well as, for Analytics at least, you have to have the proper systems in place in order for them to be effective. But what if you’re time limited and want to kick start this Inbound Marketing in high gear. Well, here are 3 things that can you do RIGHT NOW in order to get the ball rollin’. SEO is a good way to immediately start to target local, metro, and national clients. For SEO Local, you’ll hear Dustin talk about setting you up with all of the appropriate online profiles. If you have a brick and mortar business, you really should have this going for you – like now!!! This involves getting you set up on Google+, Yelp, Merchant Circle, and several others. And the best one – A mix of all 3. Obviously, text blogging includes words on your website / blog. This should be done with your focused keywords in mind and use sporadically and strategically throughout your content. Video blogging entails you, or someone, sitting in front of a video camera and shootin’ the breeze over a video. You can also use narrative style videos also where it may just be a voice, or one of my favorites, using animation videos to deliver your message. Either way, video is a powerful medium and should be included in your inbound marketing strategy. Audio blogs can include your podcast or any other audio content. Allowing your website visitors to download your mp3 right quick is a good way to get leads converted to paying clients. eMail marketing is still a good way to go. Especially, when you factor in the aspect that most of your target market can get to their emails from their smart phones and tables now is on point. Every time we meet with a client, we tell them that the big target device that you have to get to now are tablets (or phablets) and smart phones. Truth is, these little devices are married to the hands of most of the people whom they are targeting. So there you have it, 3 mediums we feel you should start using right now to beef up your inbound marketing campaign. Anything less, and you’d be shooting yourself in the foot and limping along to a successful marketing campaign. Here’s how you can tell if an inbound marketing strategy would benefit you and your organization. Go to – https://directbusinessmarketing.com/vmc/. There you will find Direct Business Marketing’s Virtual Marketing Consultation. 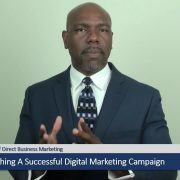 Typically, the top brass at Direct Business Marketing enjoys making videos and sharing those videos on their company’s blog, as well as, social media. It’s been proven to get the best results for them as part of their content marketing strategy. However, this may not be entirely true for you depending on how your audience likes to receive their information. Other content marketing pieces for a complete inbound marketing strategy include the use of longer video formats such as webinars. About once a quarter, the team will schedule a webinar that is typically 45 to 60 minutes. This allows the team to expound on a subject for a longer duration, therefore, delivering even more juicy content. There’re a lot of buzz going on right now in the area of inbound marketing. And if you’ve had your ear to the ground, you’d find that inbound marketing, or even content-driven marketing, can do wonders for any small business. The big hang-up most small businesses are having is what to write about on a continual basis. Want to get a clear vision for your marketing? Get on my calendar and we’ll talk. And don’t forget to share this post with your colleagues. Thanks in advance.